It’s been a beautiful March for snow, sun and great skiing. I’m sure those of you who have been “living winter” may be a bit tired of the white stuff but I’ve been grateful for the good conditions during my March stay at the cabin. Given the depth of the snowpack it looks as though we are headed into a wet and muddy spring. In this communication I’ll review some of the latest happenings in Pine Forest as well as offer a summary of the February 16, 2019 Special Meeting and Board meeting. The National Fire Protection Association acknowledged on Jan. 23, 2019, that Pine Forest successfully completed the Firewise USA program's annual renewal requirements for 2018 and is a participating site in good standing throughout 2019. Representatives of the Pine Forest Board—Anne Fox, Heather Dean, and Robin Jeffers—attended Small Claims Court, Okanogan County, on January 2, 2019, to respond to a suit filed by Chris Hopkins, owner of Lot 48. Following presentations by both Heather on behalf of the Pine Forest Owners Association (PFOA) and Chris, the judge asked for time to review the materials submitted. PFOA received the court’s decision on this matter on Tuesday, January 22, 2019. The court ruled in favor of the defendant, PFOA, and denied the claim of the plaintiff, Chris Hopkins. Holiday Greetings from your PFHOA board members! We hope this season is merry and bright for your family and friends. 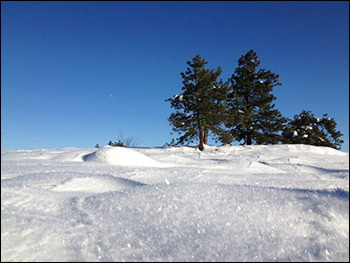 The snow continues to fall, building a good base for Methow Trails to set track. Let’s hope the snowflakes keep piling up to make for a great ski season. As advertised, so to speak, we had a board meeting on December 1. The latest Water System Consumer Confidence Report is now available. It’s hot and smoky in Pine Forest and our thoughts are with the folks affected by and the fire crews working the Twisp River fires. We are lucky to have such an organized and committed group of men and women working for all of us to prevent the loss of life, and if possible, structures. As Heather has commented in her excellent updates, we’ve had fire personnel in Pine Forest surveying roads, driveways and the layout of the community. We have water trucks on site and, as of yesterday, two Sani cans at the entrance. If you happen upon any of the fire crew please give them thanks for all they are doing for us. And to everyone, please be safe!! This email includes a number of important updates. Should you have questions or comments please contact any of the board members. And, note the third item: The Board meeting scheduled for Saturday August 11 is cancelled and will be rescheduled for a future date. As most of you already know, Brad Sawtell has resigned as Pine Forest manager. Applications are now being accepted for this position. Our annual homeowners association meeting will be Saturday, May 26, 2018, 2 p.m. at Sun Mountain Lodge. We’ve had a busy start to spring in Pine Forest with the forest health project beginning in April. If you’ve been at your PF home or visited PF recently hopefully you’ve had a chance to see all the activity. Greetings Pine Forest Owners and Happy New Year! I’m sitting at my desk in our cabin on Rocky Top, looking out onto the dense clouds and falling snowflakes. The last week in The Methow has definitely had its moments, stretching into days of low clouds and generally gloomy weather. Snow has been falling though, temperatures (almost too) moderate and the skiing good. Please welcome new owners Jordan Barrows and Rebecca Gerhart! They recently purchased the home previously owned by Vicki and Larry Anderson on Whitebark. And we’re off! Saul & crew (Tom, Shel, Mark and Alby) are thinning away along Longleaf. The plan is to try to get logs heading to Darrington by Wednesday, Nov. 1. As noted in Saturday’s (10/28) email communication, Longleaf will be closed during the day, while they’re dropping trees, but will reopen in the evening. Please use Summer Road as an alternative during that time and, for safety’s sake, please stay well clear of the active work area. Thanks for the prompt return of releases and payments for the project. Thanks to you all, we are moving another step closer to a healthier forest and lower fire risk. I am happy to report the following status of the water within our subdivision. this year, which means our water samples have passed. We also had no exceedences for our nitrate, herbicide and pesticide samples. Please let me know if you wish to see specific water quality reports. After much discussion, the Board has initiated the first steps in our forest stewardship program. Last summer’s wildfire is motivating us to attempt to make Pine Forest safer using FireWise as a guiding principle. Much of our fire danger is from trees larger than 6” in diameter and a professional forester has been hired to fulfill our goal to create a safer forest. Recently, PFOA hired Bill Berrigan of Berrigan Forestry to lead our forest health and fuels mitigation effort. Bill worked for the DNR for over 30 years, retired, and has since come out of retirement to consult on projects like ours. Bill has an outstanding reputation in the industry and is considered to be one of the best private foresters in the Pacific Northwest. He and his crew have begun flagging trees that meet certain criteria including diseased, beetle and worm infested, or clustering too close together. Trees growing too close to homes are also being flagged. After trees throughout Pine Forest are flagged, there will be an evaluation period during which time homeowners may remove flags on trees they do not want to lose. This evaluation period will end September 1st. After that the flagged trees will be cut and sold as merchantable timber. We intend that the proceeds of the sale will go into the PFOA general fund to help defray costs of this project and hopefully help build our reserves. An individual homeowner cannot be approved by the DNR for a timber sale, but as a group the PFOA does qualify. Saul Labanauskas of Brothers Fire LLC has been hired to perform the thinning activities. He is working hard to thin our green belts and numerous lots that were accepted by the DNR 50/50 grant program. This program only includes trees less than 6” in diameter. We apologize to the homeowners for not communicating with you about this program until now. We intend to have a full discussion about the merits of our efforts at the annual meeting. We began flagging trees before the meeting for you to get a sense of the potential changes within Pine Forest. Ideally we should have obtained permission from every homeowner prior to beginning the flagging but we did not. Our sense of urgency to move forward so that everyone could take time to evaluate the effects of the tree flagging was an error in judgement. For that, we are sorry. Reminder: The PFOA Annual Meeting will be held at Sun Mountain Lodge at 2:00 pm on Saturday, May 23rd. We are privileged to have Fire Chief Don Waller and FireWise spokesperson Kirsten Cook make timely presentations. Hope to see you there! Our garbage bill has fluctuated quite a bit each month due to cost overages. The overages come from two sources. First, the larger items like construction waste and furniture take up more room which leads us to use the second dumpster at an additional cost. Second, Waste Management requires extra time to pick through our dumpster at the transfer station to pull out construction waste, paint/stain cans, tires, furniture, TV’s, computers, VCRs, printers and cardboard. . Electronics, tires and hazardous chemicals need to be picked out by hand at the transfer station and disposed of properly. When the garbage man picks up these items from Pine Forest he has to quarantine the truck and empty it by hand at the transfer station, creating an additional cost to PF owners. The additional cost ends up being shared by all homeowners because it is difficult to track down the offenders. Do’s: Normal household waste, including glass and kitchen waste. Don’ts: Construction waste, paint/stain cans, tires, furniture, TV’s, computers, VCR’s printers and cardboard. Please bring these items to the transfer station located next to the recycling center in Twisp. Please dispose of the above "DON'T" items on your own. Thank you for keeping hazardous waste and recycles out of the Okanogan landfill and the Pine Forest dumpsters!!!!! !